ALD as part of SWTRA framework were asked to replace the existing drainage brackets attached to the soffit of the bridge. The brackets had significant signs of wear and the replacement was of the utmost importance as large areas of the bridge spanned housing, businesses & national rail. With the aid of Facelift and their mobile elevated work platforms, ALD successfully replaced over 500 brackets. 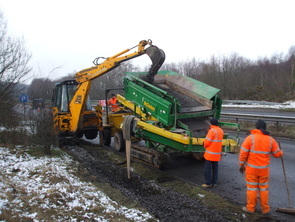 Through the SWTRA Highways and Structures Framework, ALD and their partners Cemex were brought in to carry out large scale drainage works to ease the problem of surface water forming on areas of the A465 trunk road. A4060 Dowlais Top. Concrete Canvas Ditch Lining Scheme. Via the SWTRA framework, ALD carried out over 2000m2 of ditch lining using highly innovative Concrete Canvas. For more information on Concrete Canvas and its potential uses & benefits please follow the link to their website.